France is a country located partly in Western Europe which also has territory in South America, the Caribbean, and the Indian Ocean, as well as numerous territories of various status. 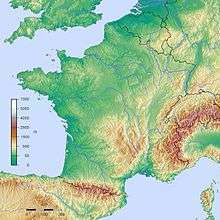 A topographic map of Metropolitan France. The upper central part of this scene is dominated by the Paris Basin, which consists of a layered sequence of sedimentary rocks. Fertile soils over much of the area make good agricultural land. The Normandy coast to the upper left is characterized by high, chalk cliffs, while the Brittany coast (the peninsula to the left) is highly indented where deep valleys were drowned by the sea, and the Biscay coast to the southwest is marked by flat, sandy beaches. Metropolitan (i.e. 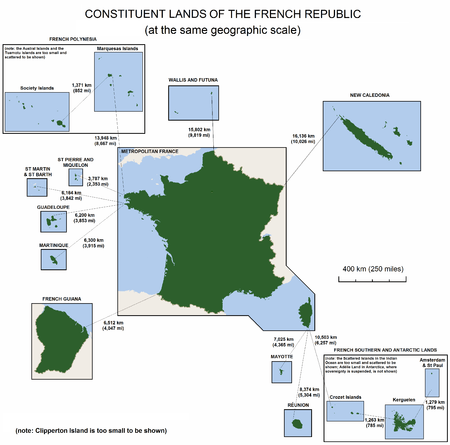 European) France is divided into 12 régions and 1 territorial collectivity, Corsica. However, Corsica is referred to as a region in common speech. 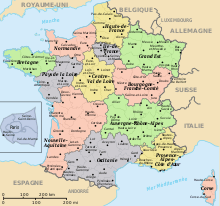 These regions are subdivided into 96 départements, which are further divided into 329 arrondissements, which are further divided into 3,879 cantons, which are further divided into 36,568 communes (as of 1/1/2004). One overseas territory (territoire d'outre-mer, or TOM): the French Southern and Antarctic Lands divided into 5 districts: Kerguelen Islands, Crozet Islands, Amsterdam Island and Île Saint-Paul, Adélie Land, and the Scattered islands (Banc du Geyser, Bassas da India, Europa, Juan de Nova, Glorioso, and Tromelin). 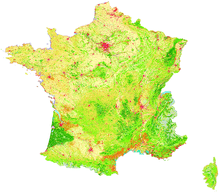 The land hemisphere—the half of the Earth with the most land—is centred on Nantes. Thus the antipodes of France are in the middle of the water hemisphere in the South Pacific. The only significant land mass antipodal to metropolitan France is the Chatham Islands of New Zealand, corresponding to an area north of Montpellier including much of the Cévennes National Park, though the antipodes of the uninhabited Bounty Islands are between Tours, Orléans, and Le Mans, and those of the likewise uninhabited Antipodes Islands are in Normandy, near Saint-Saëns outside of Rouen. 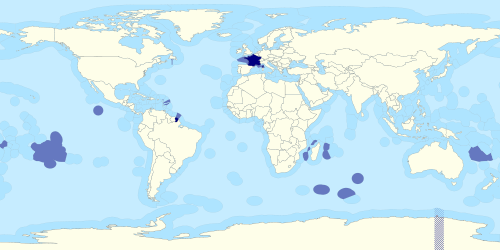 However, French overseas possessions are widespread enough that Clipperton Island and Réunion are passably close to being antipodal to each other, and several are antipodal to other countries. The Indonesian island of Buru, for example, finds its antipodes within French Guiana, as do a few smaller islands. The French Antarctic territory of Kerguelen is opposite the border between the Canadian provinces of Alberta and Saskatchewan and the US state of Montana. New Caledonia and the Loyalty Islands overlap Mauritania and southern Western Sahara, with the Mauritanian town of Zoueratte corresponding to the Isle of Pines. Wallis and Futuna are antipodal to Niger north of Niamey (spec. Féfandou near Ouallam). In French Polynesia, the Marquesas are opposite central Ethiopia; the Society Islands of northern Sudan, with Tahiti close to antipodal with Al Dabbah on the Nile. The Austral Islands cover southern Egypt and Saudi Arabia. The Tuamotus cover a broad swath of Sudan, northern Eritrea, the Red Sea, and Saudi Arabia, with Khartoum antipodal to Rangiroa and Jeddah close to Tematangi. The Gambier Islands overlap Arabia, with Mangareva between Riyadh and Mecca.